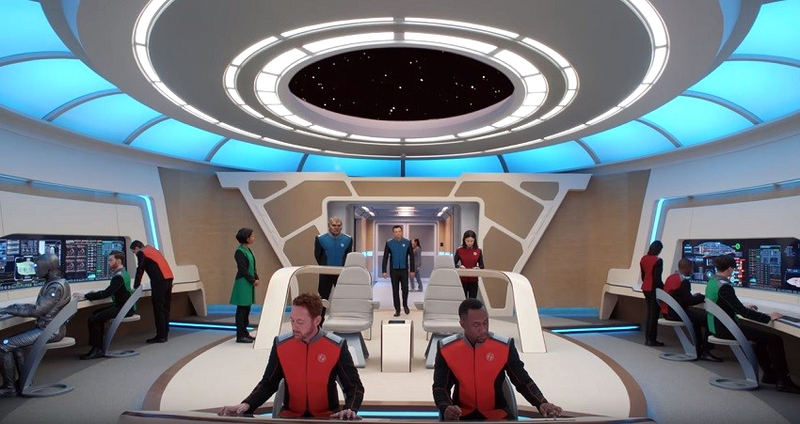 For Fox, getting a two-week jump on the relaunch of the Star Trek franchise (with Star Trek: Discovery leaving space dock on CBS on September 24) with its own futuristic space saga comedy The Orville is probably a good thing. It gives this new property a chance to find its footing and hopefully gain some traction with audiences before that far more well-known sci-fi juggernaut gets underway with a mission of reclaiming its televisual territory. With that in mind, and with a starship-shaped shadow just over The Orville‘s shoulder, how this new show fare? First of all, even with Star Trek: Discovery two weeks away, it’s impossible to review The Orville on its own terms without making comparisons to Star Trek. The Orville is clearly and overtly a Star Trek pastiche, a loving nod, an homage. All the Star Trek tropes are in place: the recognizable bridge, the holodeck, the multi-colored department-denoting uniforms, the multi-species but still mostly-human bridge crew, the space battles, the enemy aliens, etc. And just like every post-Star Trek: The Next Generation series, it’s named after the vessel on which it takes place. If you’re already a Star Trek fan, you’ll find that you’re in very familiar territory. In fact, this show stops just short of having to carry the “Based Upon Star Trek Created by Gene Roddenberry” tag in its opening credits. Some of the terminology may be shifted a bit — deflectors instead of shields, Union instead of Federation, for example — but this is clearly intended to be read as a Star Trek series (creator Seth MacFarlane is not only a self-avowed Trekker, he even made a couple of appearances as Ensign Rivers on Star Trek: Voyager). It would not at all a stretch to imagine the Orville rendezvousing with the Enterprise D at Deep Space Nine. With The Orville coming from the word processor of Seth MacFarlane, the brainchild of Family Guy, American Dad!, The Cleveland Show, and the film A Million Ways to Die in the West, you should have an idea of what kind of humor this show presents. If you’re a fan of MacFarlane’s, then you’ll probably enjoy it; for me, most of the humor fell flat — it’s not as funny nor anywhere near as cutting as what you’d find in Seth’s other shows (though there were a few genuinely funny moments throughout). 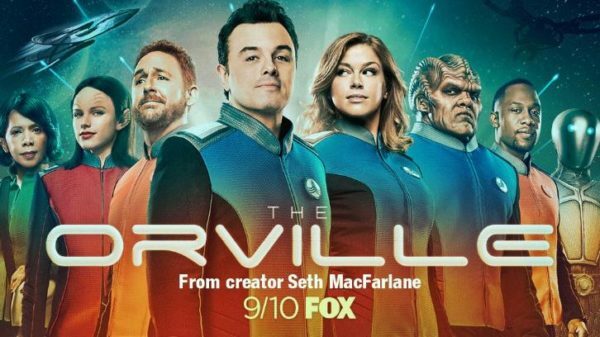 The problem is that this show really isn’t a comedy — it’s more a space action/drama with comedic moments, and Fox’s marketing of it as a comedy may well have done it a disservice. Nearly all the “funny” bits from the first episode are crammed into every one of the trailers that the network has been running for the past couple of months. There were plenty of times during the premiere episode that the humor seemed inappropriate or was simply sophomoric, or in at least one scene — Captain Ed Mercer’s confrontation with First Officer Kelly Grayson at the end of the episode — was just dumb and got in the way of the scene. So if it’s not a comedy, how does it work as a sci-fi action/drama? Well, better at least. The Orville looks fantastic. The production values are extremely high, with good sets, well-designed aliens, decent ship designs, etc. In the first episode, the Orville is dispatched to answer a call for supplies from a science station. When they arrive, however, they find that the station is under threat from an antagonistic race called the Krill. One of the station personnel is working undercover for the Krill, of course, and sells out the station staff and the Orville crew at gunpoint. The Krill ship and the Orville engage in a ship battle and only some quick thinking and a clever trick saves the good guys. It’s a fairly standard, straightforward plot, but for a first installment, I think that’s forgivable. It’s giving its audience easy access to this new setting. The test will come later, when the show has had more chance to find an established audience — will it get more adventurous in its storytelling, stray a bit further from its source material? We’ll see. Where Star Trek shows excel, though, is in character. What made The Next Generation the huge success that it became was its cast of characters. These were characters that you grew to know and love, that you looked forward to spending time with each week. You cared about their journey, both as a crew and as individuals. Does The Orville have that? Honestly, it’s too early to tell. The characters are interesting, that’s for sure. You have Bortus, a member of the single-gender Moclan race; there’s Alara Kitan, a Xelayan whose home planet has a gravity far greater than Earth’s, giving her the equivalent of superhuman strength; the pilot and navigator are Malloy and LaMarr, who hit it off immediately and become best friends; and the mechanical Isaac, an artificial lifeform from Kaylon who, like all his race, consider organic beings to be inferior. As long as the childish humor doesn’t get in the way and the characters are allowed to develop and form meaningful friendships with each other, this show will be fine. That leaves us with our two main characters: Captain Ed Mercer, played in smarmy-frat-boy-with-charm mode by MacFarlane, and First Officer Kelly Grayson, confidently portrayed by Adrianne Palicki, fresh off of her stint as Bobbi Morse in Agents of SHIELD. They have a history, you see. They were married. Until, that is, Ed comes home and finds her shacking up with a blue alien. A year after their bitter divorce, they end up serving together on the Orville. With so many unresolved emotions, their plight tends to spill over into their job. They take digs at each other at inappropriate times, they argue in front of the crew, and in what I’m sure is supposed to be a funny moment, they drag the Krill captain into their marital dispute in the midst of his “hand over the alien thing at once or else!” speech. It comes across as childish and grating, and I sincerely hope that this angle is dropped in future installments. I’ll be generous and give this show a solid B based on the potential it has. I find that I enjoyed the first episode just enough to remain interested in seeing how the show develops. The main thing that The Orville has in its favor is that after its premiere, Star Trek: Discovery will not be on network television, it will be made available exclusively on CBS’ streaming service All Access, leaving Orville more or less peerless and competitionless during its run. That may help it to pick up an audience. But once it does, it has to deliver good scripts with clever storytelling, featuring characters that viewers will enjoy spending time with each week. Otherwise, it’ll be a short mission for the good ship Orville. So far it has all the Star Trek trappings, but it doesn’t have Star Trek‘s heart. Galaxy Quest this ain’t.